My name is Grant, I just turned 13 years old (I'm a teenager! ), and I like chocolate ice cream. 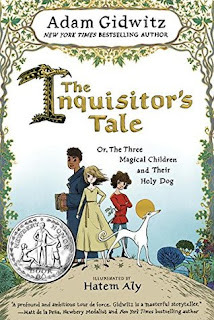 I read The Inquisitor’s Tale and I picked it because I’ve read Adam Gidwitz’s Grimm series and loved those books. I love how all of the characters backstories were explained in the beginning and then the story tied them all together. I would probably live in the forest and hide. I’m not as brave as the characters are. I couldn’t do what they had to do. There are so many magical aspects to this story! The cover is magical too. The gold lettering really stands out. I also love the illustrations inside the book. They really help to tell the story. It is similar to Mr. Gidwitz's Grimm series because it incorporates old stories in a new way. I like how The Inquisitor's Tale includes stories about religious belief. Did your inspiration for this book come from history? Adam Gidwitz answered this question in his author's note and expanded on it in an interview with Publisher's Weekly. "[T]here was this Indiana Jones aspect to medieval history that hooked me, and since we wound up traveling to Europe every year, eventually I began to wonder if I could get a book out of it. I started trying to organize the stories I had collected about six years ago." Thank you to Grant for sharing The Inquisitor's Tale with The Kidliterati!